Generally when the Wilmette Institute writes about what its learners get out of the courses they take, we select one student and discuss his/her learnings in detail. This time we are taking a different approach with a tribute to Paula Bidwell, who passed away on September 16, 2016. Paula, a Wilmette Institute learner and faculty member, was a Native American Bahá’í of mixed-Indian blood—Lakota, Cherokee, Shawnee, Delaware, and Seneca—with some Northern Italian from her mother. We have selected six learners enrolled in the last course she created, Native American Religion and Spirituality (faculty: Paula Bidwell, Kamao Cappo, and Richard Hainsworth), and are sharing their comments on a number of themes. The comments these six posted in their Learning Self-Assessment at the end of the course are a living tribute to how much Paula’s insights, deep learning, and spirituality affected those who came in touch with her as friends and learners. I truly enjoyed taking this course. Although I was not able to place a post in each unit, I managed to read most of the participants’ posts as well as the material and watched a few video clips. I shared some of the topics/issues (for example, the Standing Rock issue, the Truth and Reconciliation Commission report, Ruhíyyih Khánum’s letter, the residential schools, stereotypes, Indian mascots) with my family and discussed them at the dinner table and during our family-reflection time. I think the highlight of my readings was the article “The Soul of the Indian” by Charles Alexander Eastman. I like the fact that most of the articles were only a few pages long and easy to follow. This course has provided me with useful background about the history, culture, and challenges of the Native peoples of the United States and Canada. I hope to make a summary in PowerPoint form and share it with others in the future. My sincere gratitude to the course organizers and the participants. Now let’s get to know a bit about the remaining five learners we have chosen from Paula’s course. Kathryn Brown, from Beloit, Wisconsin, USA, lives on a farm with her Choctaw (Oklahoma) husband and enjoys bee keeping. Once a month a group of Native Americans (Lakota) come to her farm for an Inipi (sweat lodge) and ceremony. Jane Harper, a resident of Eliot, Maine, and a recent retiree starting on a new phase of her life, intuitively knew that she had much to learn when she saw the course being offered. Allison Maires, a middle-school teacher and one of four in a “Ventura, California, Group,” has always tried to learn as much as possible about the Native peoples living near her, the Chumash and the Miwok. Gretchen Misselt, from Washington Island, Wisconsin, USA, is a docent in a history museum where she has to field questions about the Native American presence (Pottawatomie and Oneida) on the island. Janice Okuma, a widow and another retiree searching for the next phase of her life, was a second member of the Ventura, California, Group and one who has always felt the pull of the spirituality of Native Americans on her. Not every learner wrote about every topic in the Learning Self-Assessment, but all of them had something to say about what they had learned in the course, and five of the six undertook or plan to undertake some sort of final project. Let’s being with the learners new understandings and new insights. Gretchen Misselt, from Wisconsin, researched the Pottawatomie and Oneida tribes and did extra reading, and compiled a wish list of readings. Changes in Values or Beliefs. Applying or Using New Learnings. Kathryn said she will now “recognize cultural misappropriation and speak out about it,” will explain the need to abandon mascots that use Native names and images wrongfully, under the lame excuse of ‘honoring the culture,’” and “explain why phases such as ‘Have a pow pow,’ ‘they need to smoke the peace pipe,’ or ‘off the reservation’ are offensive and inappropriate.’” By “cultural misappropriation,” Kathryn explained, she means the adoption of cultural rituals and objects by the dominant culture, using such objects and practices for profit, changing sacred ceremonies to a form of entertainment, and engaging in these cultural practices after minimal exposure, resulting in distortion of meaning. Examples are charging admission fees to a pipe ceremony (Chanupa), sensationalizing a Sun Dance, or using ancient praying songs in team cheering. 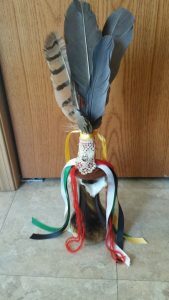 As for the two art projects: Kathryn made a fan to be used in smudging and in healing ceremonies. It includes hawk owl, and eagle feathers, as well as a bit of her grandmother’s lace, the Bahá’í symbol, a gold spider that came from her mother (a remembrance of the Spider Woman story), a silver pin of a figure reaching to the sky (a long-ago gift), the colors of the four directions, and some ribbon work. We owe Paula Bidwell a debt of gratitude for her offer to the Wilmette Institute to start courses on Native American religion and spiritually. We are also grateful to her for her ability to inspire learners to speak up for First Nations and Native American peoples with more knowledge and more empathy. Surely the mention of the names of a handful of the many Native American tribes (the Passamaquody and Penobscot from Maine, the Lakota, Pottawatomie, and Oneida from Wisconsin, the Choctow from Oklahoma, and the Chumash and the Miwok from California) are bringing happiness to Paula’s always spiritual heart. Native American Religion and Spirituality is being offered again from April 1 through May 18, 2017. Faculty will be Richard Hainsworth and Brian O’Flanagan (Paula’s husband).